So I did it. I made homemade, from scratch, didn’t-even-use-a-stand-mixer, pasta. Fettuccini to be exact. And it tasted GOOD. Really good. Trust me when I say that no one is more surprised about this than me. I have a terrible habit of tackling new endeavors like this and having an epic fail on the first go round. If I had been blogging during my first attempt to make a pickled green tomatoes (yeah, you heard me right) or stir-fry (how does the garlic not burn when the pan is that hot?!?) or any number of other things, you would know how it works: first time = trash and ordering take out. But now, the curse has been lifted!!! At least when it comes to pasta. I decided on an egg pasta recipe from Allrecipes.com you can find it HERE. I chose it because I wanted one that used semolina pasta as everything I’ve ever heard is that it’s the most traditional way to make it. I cut the recipe in half and got to work. Oh yes, wine is considered hardware and software. Now, as I am still finding my way with the whole “taking pictures while I cook” thing, there’s not a shot of the dough being formed but luckily I remembered to take one of it when I was done with it. Yay me! This was the end result after much kneading by hand (I do have a stand but I wanted to do it by hand as much as possible) and the possible onset of carpal tunnel syndrome. If you have a stand mixer, I highly recommend its use. But good news!! It looks like it’s supposed to! It smells like it’s supposed to!! Onward! Now, it’s Tool Time. The pasta machine is out and ready to go…but…there’s no directions in the box. Well, actually there are but they’re for a unrelated food processor (huh?) so I’m winging it. I’ve got it assembled and clamped to the counter, what other directions do I need?? Turns out, some more. I didn’t know about the doubling over of dough and putting back through the machine until AFTER the whole thing was done. Next time. Here’s a shot of the dough after being put through the machine. Minced shallots, garlic and thyme along with butter and white mushrooms. Center cut chops, all seasoned up and raring to go. Love, love, love my cast iron grill pan! ‘Shrooms dancing it up with the garlic and shallots. They’ve been sprinkled with a little flour to thicken the sauce. White wine, a little chicken stock and some thyme are thrown in and brought to a simmer. Almost there!!! Ta-da!! 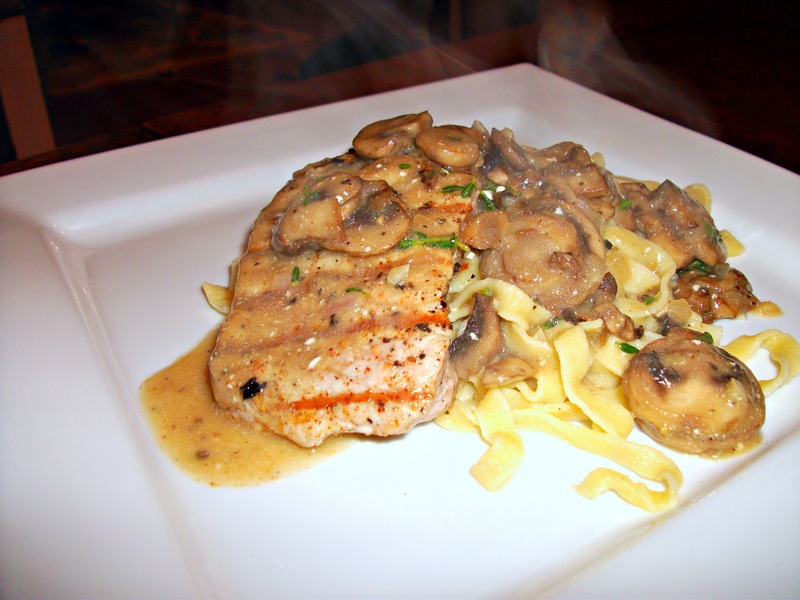 Delicious pork chops with mushroom-thyme wine sauce and homemade fettuccini! Yummy! That looks so delicious! I love homemade noodles. I’ll definitely have to try this. thanks for posting it! What a beautiful meal – it looks delicious! I’m not laughing at the pink appliances (I love them actually! ), but the glass of wine front and center is making me chuckle. It looks like something from my own kitchen! Your blog is beautiful; I enjoyed stopping by!